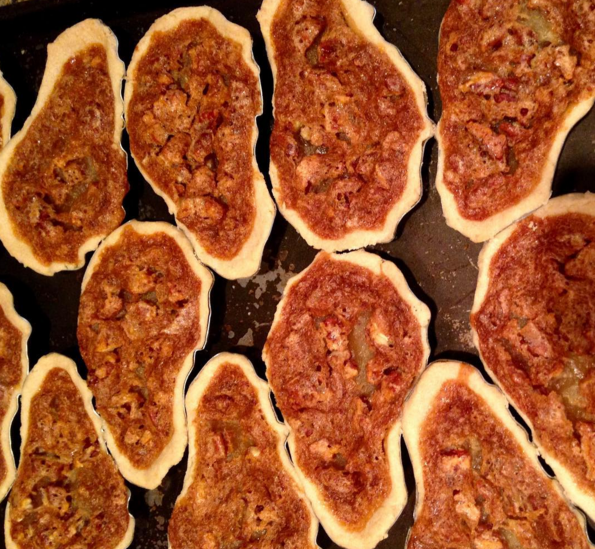 Easy Breesy Mini Pecan Pies with SOS Oyster Shells! Mix flour, sugar and salt in food processor. Add butter and shortening. Using on/off turns, process until the mixture resembles a course meal. Drizzle 3 Tb cold water and process until moist clumps form. Gather dough into a ball. Flatten into a disk with a rolling pin. Transfer dough into each oyster shell. Lightly pressing at the grooves to ensure there are no air pockets. Using a paring knife, cut the edges of crust off the sides of the oyster shell. Cream together the butter and sugar. Add the flour, salt, vanilla, and light corn syrup slowly, then mix well. Add eggs, one at a time, beating thoroughly between each egg addition. Add the toasted pecans. Spoon even amount of the pecan mixture into each crust filled oyster shell. Place the oyster shells on a cookie sheet and place in the oven.